The tires on your Mazda3 or Mazda CX-5 are your direct connection with the road, so it’s important that they’re performing as they should. 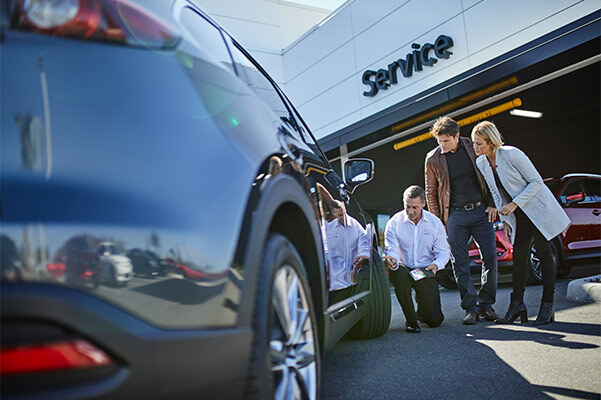 At our San Antonio Mazda tire center, our Mazda service experts can inspect your tires and make any necessary repairs or replacements. If you’re interested in buying new tires for your Mazda, we can help you make a selection. Our tire inventory includes name-brand tires for all different Mazda models, ensuring that you can get the right tires for your Mazda car or SUV fast. Contact us to schedule Mazda tire service or visit our Mazda dealership in San Antonio, TX, to speak with a Mazda service technician. Our Mazda tire center in San Antonio, TX, can handle any tire service or repairs your vehicle may require. We can take care of tire balance and rotations, flat tire repairs and more. If you need to buy new tires for your Mazda CX-9 SUV or Mazda6 sedan, we can help you pick out the right tires for your Mazda, whether you’re focused on off-road performance or smooth city cruising. We’ll look at your vehicle and help you pick out the tires that fit perfectly and that are best suited to your vehicle’s capabilities. If you’ve experienced a flat tire, it’s likely you were able to swap out the spare tire on your own or call a tow service for assistance. Our Mazda service technicians can look at the flat tire to see if it can be repaired. If a tire repair isn’t feasible, we’ll be able to swap it out with one of the tires in our inventory. Our Mazda service center provides fast and expert service so that you can get back on the road that much faster. No matter what kind of Mazda you drive or how many miles are on the odometer, you can rely on the tire experts at North Park Mazda.